Twice in the last two weeks, longtime White House correspondent April Ryan has been the subject of news stories: once when President Donald Trump made an unusual request of her during a White House press conference and after a heated exchange with Trump adviser Omarosa Manigault. But the two occurrences do not define her nor have they inhibited her from speaking on topics dear to her heart, including her new book At Mama’s Knee: Mothers and Race in Black and White, which was released in December 2016. 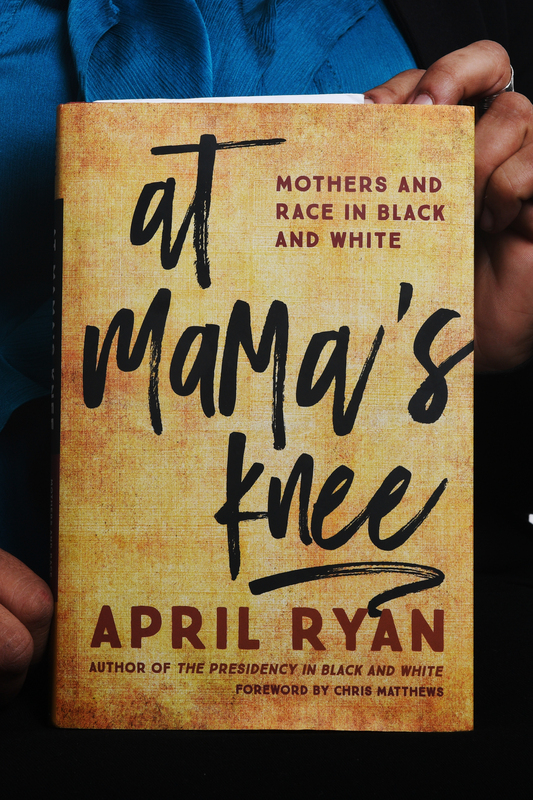 At Mama’s Knee combines Ryan’s personal story, her experience on race from her perspective at the White House, conversations with her mother, and a look at how she educates her two daughters as a single black parent in Baltimore. It weaves in accounts from well-known people about what their mothers told them concerning race and how they talked about the topic with their children. Ryan, 49, works from an office right behind the White House press briefing room, preparing stories for listeners of 300 affiliates of American Urban Radio Networks as well as readers of her blog Fabric of America. Trump is the fifth president she’s covered. During the past two weeks, Ryan, who prides herself on delivering news and not being part of it, has become the center of attention. Trump asked her to set up a meeting with the Congressional Black Caucus following a question she addressed to him about meeting with members of the organization. Despite the recent drama, Ryan embraces her life as a journalist, author and mother. At Mother’s Knee includes accounts from Sybrina Fulton, mother of Trayvon Martin, U.S. Rep. John Lewis (D-Georgia), Clinton, U.S. Sen. Cory Booker (D-New Jersey), Christopher Darden, Valerie Jarrett, Iyanla Vanzant, Harry Belafonte, presidents Barack Obama and Jimmy Carter and others. In her first book, The Presidency in Black and White: My Up-Close View of Three Presidents and Race in America, Ryan used her experience as a White House reporter to relate a narrative about race in America. When President Trump asked you about arranging a meeting with the CBC, how did that make you feel? I couldn’t believe he said that. I was like, ‘Is he kidding?’ I said no, because as a journalist I’m not supposed to do that. He didn’t have to call on me, but he did. I was happy he did that. How are you handling the situation with Omarosa? How are you handling the chaos? It’s not chaos. I wish her well. How do you prepare to deal with the president? There is nothing hidden when it comes to Donald Trump. We see who he is. We see that, we believe it and we march on. He is not George W. Bush. He is not Bill Clinton. He is not Barack Obama. He is uniquely Donald J. Trump. And he’s got a learning curve. I see that. So I have to be aware of who he is, be aware of if I ask him something, he may throw me off like he tried to do the other day. But understand, he is different from the last three that I dealt with, so therefore I govern myself accordingly when it comes to him. Do you have any insight on the president’s expected executive order on HBCUs [historically black colleges and universities]? The way we understand it is they are going to take the HBCU initiative out of the Department of Education and put it under the White House. That’s one piece. They want to have a microscope on it because it’s a big issue. They want to make sure that the 105 HBCUs succeed. There are a lot of issues there. You’ve got the Pell Grant issue, the Parent Plus Loan issue, you’ve got some of the schools that are failing and some of the schools are succeeding. What I’m hearing is that they want to strengthen the financial component. I’m a mother and I talk to presidents about matters of race and urban America. But I would be remiss if I didn’t talk to my children, particularly when it’s right in our backyard hitting us hard. And the crazy thing about it is that I really started dealing with it when Tamir Rice was killed. I felt like I was at a crossroads with it trying to figure out what to do, how to do. And I wanted to see how other mothers related to the issues and certain periods of time. “At Mama’s Knee” is April Ryan’s second book that deals with motherhood and race. What inspires you as an author, as a correspondent and as a mother? My kids. They inspire me. I love it when they come home happy. That’s inspirational — the fact that they look to me as inspiration. I always say the words ‘aspire to inspire.’ I don’t think I’m aspiring to greatness or anything. I think I aspire to a greater day. I think I aspire to do the best I can on my job. To report the story and give the facts that others may not see or look over. Find stories that are in my community that people don’t know. I’m inspired by people who march on in the midst of it. And that could be anything – crisis, heartbreak, sickness, or confusion. I’m inspired by that. I’m really inspired by those testimonies, those stories that really show the resilience. How long did it take you to write At Mama’s Knee? It was about a year. The first book was tough. The first book was 17 years. It was kind of an interesting transition for me between the first book and this book. I felt I couldn’t get my mind off The Presidency in Black and White. It was hard to transition. And I did. People say this is just as good and even better. I’ve been taking notes for a possible next one. Talk about your evolution from the first time you stepped into the White House until now. I was green as green can be. It was amazing. Every time I walk into the White House, it’s a fresh new start. Something new every day. Everyone doesn’t get to go to that place. Everyone doesn’t get to walk into that press room. Everyone doesn’t get a chance to question presidents. It’s a fresh new day and it’s something I’m very thankful for. Twenty years ago, I was green. Twenty years later, they call me a veteran. There’s a lot that I can still learn. That place is very dear to me. The issues are very dear to me. I just can’t believe that 20 years later, I may be one of the longest-serving White House correspondents who happens to be African-American. It’s a very interesting position. It’s a very interesting time. I’m just thankful for each day. Do you remember the first question you asked a president? It was in the hallway and I asked President Clinton to call me by my name. I introduced myself and I asked ‘Will you call me by my name?’ He said, ‘Why is she worried about me calling her by her name?’ Because that’s Washington power. When a president sees you and calls you by name – April Ryan or April. As an author, how do you turn the White House off and flip to writing? When I leave the White House, I cannot stand talking about politics when I get home. I watch it. I read it and I eat it. I switch it off. And when it comes to writing, this is crazy, but I could be in the middle of something and something came to me and I email myself. I may get up at 4 or 5 o’clock and start writing. I need that peace, that moment and I find myself just getting angry because I have to shut it off because I have to move on. What was the most challenging part of writing your new book? The most challenging part of At Mama’s Knee was just writing my story. As a journalist, we are not the story. You know a lot about me in this book. The first one, I was scared. I had never written a book before. I’m a radio person. We give it to you in 30 seconds or less. I write that way. We give you the meat. So I was scared. I was like, ‘People are not going to like this.’ But they did. And I had to get out of my own way because I was defeating myself. As a radio journalist, how do you want to deliver information to listeners? I like to grab the audience with impacting statements, things they haven’t heard before. I like to bring the audience in and bring them with me on the journey. How would describe your life thus far? I have markers in my life. I was a kid that didn’t think that I really was going to do what I’m doing. I didn’t know what I wanted to do, but I wanted to do something significant. I used to want to be a lawyer. I wanted to be this, I wanted to be that. I wanted to be a journalist. I wanted to be in TV. But I wound up being in radio. I look at how it happened. Just walking out on faith and thinking I could do anything and thinking I could succeed. I guess I did. I’ve been here 20 years. That was one marker. The biggest marker was when I lost my mother 10 years ago. She was my best friend. You realize once you have life-or-death issues what you will or won’t take. I realized that I lost the biggest piece of me, my biggest champion, my biggest critic. And I was not living the life I thought I should be leading, meaning I didn’t feel my personal life was right. There were some changes in my life. I became a divorced single mom. I had two children. When you come face to face with death, you look at things in a real tangible way. My life changed and, really, it changed for the better, meaning I found myself again. I was true to myself. I’ve not looked back. I love what I’m doing. I enjoy it. I walk through life just thankful for the people and the experiences. They need to talk to their children because it’s a life-or-death situation right now. We are the influencers. We help shape how they formulate their mindset on certain issues. We help them walk down that narrow path that sometimes may narrow even further, or it may widen. We help them understand the dynamic of a world that we’re still trying to figure out day by day. We try to give them the tools – lifesaving tools – to help them to thrive in this world. I think we need to talk to our children and let them know where we come from, who we are and hope for tomorrow. Loving on my children and trying to take a vacation and I know they [publishers] want me to write another book.